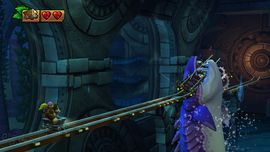 High Tide Ride is the second level of Sea Breeze Cove in Donkey Kong Country: Tropical Freeze. It is the third minecart level in the game, and the first to introduce parallel tracks. Donkey Kong must constantly switch between these tracks by tilting left/right while pressing to avoid certain obstacles. For the majority of the level, rather than have a side-scrolling view, the camera is positioned at an angle allowing the player to see the tracks more easily. The music used in the first portion of the level is a slight variation of the title screen music of the game, but dissolves into an original song as the Kongs enter the cave. Donkey Kong and Diddy Kong on the minecart before entering the cave. At the start of the level, just beyond the two wooden platforms is a Barrel Cannon that launches the Kongs onto the minecart. While travelling down the path, the Kongs must jump along parts of a broken railway track levitated by water spouts and avoid two Snaggles en route to the first checkpoint. Shortly after that, the Kongs ride down a steep slope into an underwater cave, where they must jump over a Blue Hootz and reach a gate opening the way to a set of three parallel tracks. The Kongs must switch lanes to avoid colliding into the wooden barricades and falling off the end of a track, along with more Blue Hootzes. After the paths converge, just before the next gate, a Gargantuan Gills suddenly appears from the water and eats out part of the track, forcing the Kongs to jump over the resulting gap. Past the gate, the Kongs travel down a pair of parallel tracks; during this portion, multiple wooden panels that move left and right block one of the paths, forcing the Kongs to transfer to the other. The Kongs eventually reach the next checkpoint, where the camera returns to its side-scrolling view. During this section, large stone blocks drop from the ceiling, forming a track for the Kongs. They must also duck under spiked blocks that drop down, and avoid more Snaggles. After launching out of a Barrel Cannon, the camera reverts back to its angled view as the Kongs must jump along a series of more tracks levitated by water spouts. Shortly after the third checkpoint, the Kongs will enter a Barrel Cannon that takes them to a set of five parallel tracks, while the camera pans to an overhead view. Several weights drop onto the tracks, forcing the Kongs to switch tracks constantly to make their way through. After the paths converge, the minecart derails and throw the Kongs onto a platform where the Slot Machine Barrel is found. K: Obtained by jumping off the higher of the two rail tracks shortly after the first water spout. O: On the left parallel path just after the first set of parallel tracks converge. N: Above a pair of Blue Hootzes a short distance after launching out of a Barrel Cannon that opens a gate. G: Found on the second track from the left of the five parallel tracks. Underneath the first platform at the start is a Barrel Cannon leading to a Bonus Area. The Kongs must use the vines here to collect all of the bananas to earn the Puzzle Piece. Found on the edge of the track just past the barricade, after jumping past a pair of Snaggles. Revealed after collecting all of the bananas on the first set of parallel tracks. Revealed after collecting all of the bananas in the section with the moving wooden panels. Near a lone stone block that falls from the ceiling and sinks into the water. German Aquattack Portmanteau of aqua and attack. This page was last edited on April 15, 2019, at 12:36.